Oscar Pistorius is back in jail today, sentenced to 6 years following last month's re-sentencing hearing which was the result of the state winning an appeal over the judge's decision to toss the murder charge. The judge said there were mitigating factors and rejected a prosecution request for a 15 year sentence. He will be eligible for parole in 3 years. Mr. Pistorius, the judge said, had shown genuine remorse in trying, repeatedly and unsuccessfully, to apologize in person to the victim’s parents. 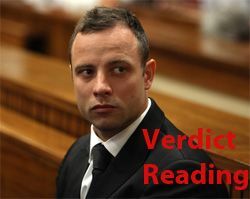 Oscar Pistorius has been granted bail pending the outcome of his new appeal and should that fail, his sentencing. His next court date is in April. He is appealing the recent appeals court decision changing his manslaughter conviction to murder to the Constitutional Court. From reporters covering the hearing on Twitter: He will remain on house arrest, but is free to leave the house between 7 am and midnight. He will be allowed to travel within 20km of (his uncle's house in Waterkloof, Pretoria. The South African appeals court has ruled the trial judge in the Oscar Pistorius case erred in dismissing the murder charge. He won't get a new trial. He now stands convicted of murder, and the case will be sent back to the trial court for resentencing. Bad ruling as I've opined many times. Oscar Pistorius will be released from prison on August 21. He will have served 10 months of his 5 year sentence. South African sentencing guidelines that say non-dangerous prisoners should spend only one-sixth of a custodial sentence behind bars. He will serve the remainder of his sentence on home detention. He also faces the state's appeal of the dismissal of the murder count against him in November. He has been serving his sentence in the hospital wing of the prison. Oscar Pistorius may be eligible for release from prison by August. He would finish his sentence on home detention. The timing is significant because it is unlikely the appeals court will have heard the state's appeal by then. The National Prosecuting Authority (NPA) on Friday said it would only submit its transcripts to the High Court at the end of May; and a date for the appeal would only be set after both the State and defence file their heads of argument. This will most likely take around two months, which means it would be heard once Pistorius becomes eligible for early release. The judge in the Oscar Pistorius trial has ruled the state can appeal her judgment of culpable homicide and dismissal of the murder charge against Pistorius. She ruled that she can't say it's a remote possibility that the appeals court might rule differently on the legal issue of whether dolus eventualis applies. 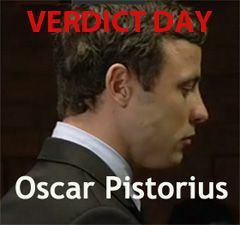 She refused to allow the state to appeal Oscar's sentence for culpable homicide. She said that's a factual ruling and she made it based on the evidence presented. So if the appeals court upholds the judge's ruling dismissing the murder charge, his sentence cannot be increased. The prosecution in South Africa is appealing Judge Masipa's ruling in the Oscar Pistorius case. It claims she misapplied the doctrine of dolus eventualis and should have found him guilty of first degree murder. It also argues his sentence was too light. The prosecution's filing is here. An article supporting her judgment is here. Another is here. Yet another is here. My view, as I've expressed many times: the appeal should fail and I disagree with the articles taking the opposite view. Update: The judge sentenced Oscar to five years in prison on the culpable homicide charge and imposed a three year suspended sentence on the firearm count. The sentences will run concurrently. He was taken into custody. Neither side indicated they were going to appeal, and there was no mention of bail pending appeal or a delay to put his affairs in order. Oscar sat by himself throughout the sentencing, and did not display any emotion at the sentence. I didn't see any interaction between Oscar and his lawyer during the proceeding or after. Roux said there was also "no conscious unlawfulness" from Pistorius. He described Pistorius' suffering, both emotional and financial, since the Feb. 14, 2013 shooting. "He's lost everything," Roux said of Pistorius, once an inspirational figure who became the first amputee to run at the Olympics in 2012. "He was an icon in the eyes of South Africans." ...."He's not only broke, but he's broken. There is nothing left of this man," Roux said. He said that Pistorius "hasn't even the money to pay for legal expenses. He has nothing left." Oscar Pistorius' lawyers presented more witnesses today, including his manager. The prosecutor, Gerry Nel, was his usually bombastic self. He has a real attitude, and it has not been lost on the judge in this trial. 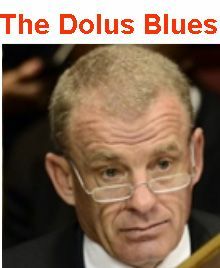 Mr Nel described Mr Maringa's suggestions as "shockingly inappropriate", adding that they would amount to "no sentence". He questioned whether Mr Maringa understood the gravity of Pistorius's crime. Judge Masipa has finished reading her verdict in the Oscar Pistorius trial. 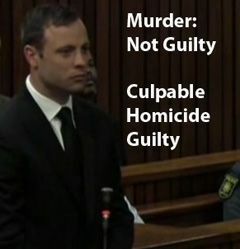 He is not guilty of murder but guilty of culpable homicide. She found him guilty of one count of negligent handling of a firearm (the one that went off in the restaurant) and not guilty of another firearm charge (shooting through his sunroof.) She found him not guilty of illegal possession of ammunition. 4:15 am: Glad I stayed up for one more segment. The Judge has just rejected premeditated murder. The state failed to prove its case. She spent some time saying Oscar was a poor witness and not candid with the court, but said that isn't enough to conclude he's guilty. His testimony must be viewed in conjunction with all the evidence presented. Again, it's going to be not guilty of premeditated murder, but she's leaning towards guilt on culpable homicide. She has discretion in sentencing at that charge. Big loss for the arrogant, bellicose prosecutor. Huge win for the defense, blocking a life sentence. 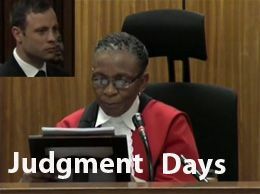 Judge Thokozile Masipa will deliver her verdict tomorrow on Oscar Pistorius. Time Magazine has this rundown of how the verdict will be delivered and the possible outcomes. 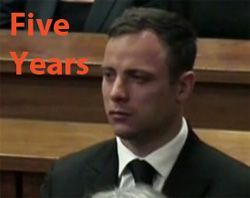 [I]f there are any convictions on the four charges Pistorius faces — murder and three unrelated firearm charges — sentences will only be decided later at a separate hearing. The Guardian has this summary of the charges and each sides' arguments. Closing arguments have ended in the Oscar Pistorius trial. The judge will issue her ruling on September 11. You can listen to the arguments on Soundcloud here. The defense said it comes down the 20 seconds where he was standing at the entrance to the bathroom. He was standing there without legs, facing the door. He hears the sounds and fires the shot - was that reasonable? If the judge finds that was reasonable, she must acquit him. The Evidence Room of Cleveland, Ohio has a problem. It was retained by the defense in the Oscar Pistorius case to create a re-enactment of the shooting of Oscar's girlfriend Reeva. 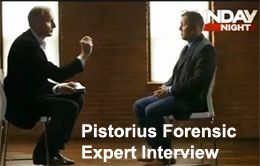 In the exclusive interview, Roder says he is convinced Pistorius did not mean to kill his girlfriend on the morning of February 14, after weeks of interviewing and analysing the evidence. "Absolutely, they physical evidence is consistent and his story remains unchanged," Roder told Sunday Night reporter Ross Coulthart. "If you look at the evidence Oscar's clearly not guilty.